Arriving to Moab for the first time, my eyes were pinned to the windows, watching the red sandtone walls passing by, just mesmerizing. But then again there's something about the deserts of the Colorado Plateau, with its winding canyons, soft red rock and sky-scraping pinnacles - it's special, unusual. While we wandered around for a couple of weeks climbing and hiking Bran and I were running out of time in Utah and needed a grand finale to this leg of our trip. Tower climbing had always been an item on our list. It's challenging both mentally and physically. It requires every ounce of your energy and demands the utmost respect for the tower and the climbers who summitted before you. Therefore, what better way to end our time in the desert but by climbing a classic tower. Castleton Tower is considered one of the most famous desert towers in the world. That fact alone can be alluring to someone who has not summited a tower and hasn't even seen any desert towers. So after hours of deliberation and some persuading, the North Chimney of Castleton Tower was the route we were going to attempt - 4 pitches of moderate climbing that ended with a spectacular view from the top. So there I was, 7 am on a brisk morning charging up a steep trail with a full pack. 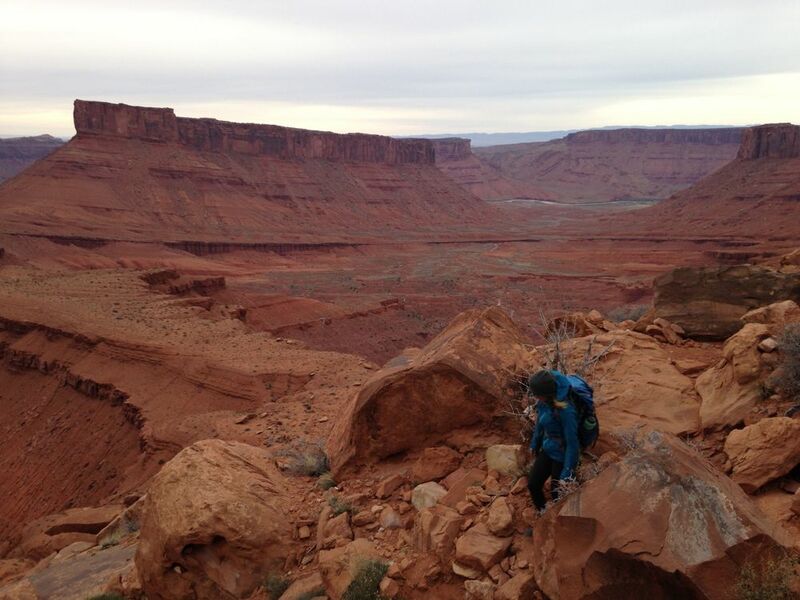 Unlike most early mornings with Bran that involve steep trails and heavy packs, this one was a little different. The entire time up this trail the Castleton Tower is watching you. This tower stands about 1000 feet tall over the valley floor with nothing else around. It sits at the top of a mountain and intimidates the hell out of all the hikers, climbers and passersby. This. Is. Terrifying. The usual thoughts enter the mind: What am I doing here, I can't climb towers, This is ridiculous. But then I look up again at this alarming, giant rock and it's as if I can't stop getting closer. The curiosity won't allow me to just turn around in defeat. I just have to keep going. After some scrambling on loose gravel and bouldering up to the start of the climb, the nerves calmed down a bit. When we arrived we were behind a couple of parties but we were in no hurry so decided to wait it out - the sun was shining and the views weren't half bad either. As we sat and waited our turn to begin the climb I couldn't help but think about the people who first found this tower and then climbed to the top. They had gear that was much heavier, shoes that weren't nearly as sticky and no idea if this tower would be their last. It's humbling, inspiring really. But after about an hour of sitting and relaxing it was our turn to attempt the beginning of the climb. With a nervous excitement Bran took off. He climbed the first pitch with ease and would shout down occasionally "This is AMAZING!" and "WOW - SO GOOD!". Needless to say I was getting stoked. Before long, Bran was at the anchors and it was my turn to get up the first pitch. To say I got up with ease would be a bold and blatant lie. This was challenging. The cracks were too large for my hands, too large for my fists, and there were not a lot of options outside of the cracks. My climb was anything but graceful. But somehow, some might say miraculously, I made it to the first anchor. I was exhausted, tired, and hungry but the tower demanded more of me - we were not turning around. 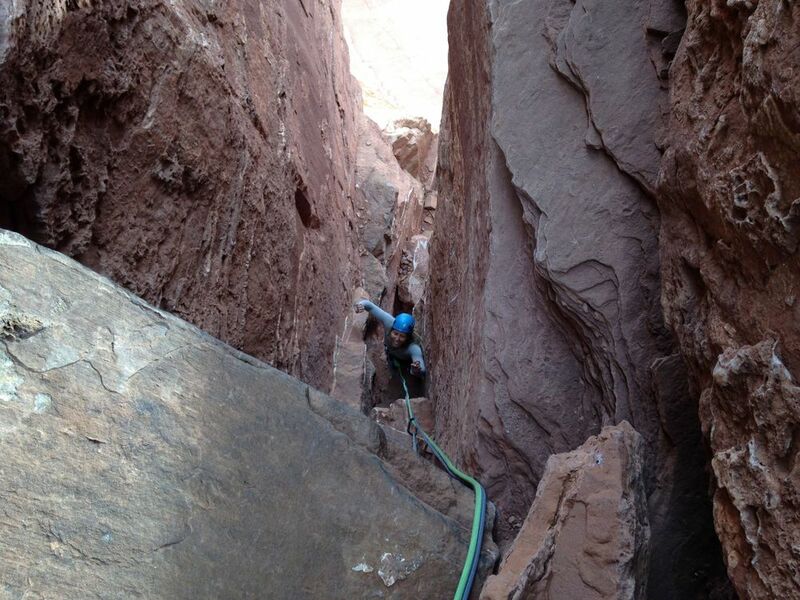 The second pitch starts with an offwidth crack (too wide to jam any body part in to hold yourself to the wall but too small to squeeze your body in to climb like a chimney). I knew it would be work when Bran struggled and heaved and yelled and scraped his way through the first 4 feet of the climb. Yikes! He managed to get his way up and through the crux section arriving to the second anchors with once again ease and control. It was yet again my turn to attempt to get closer to the summit. 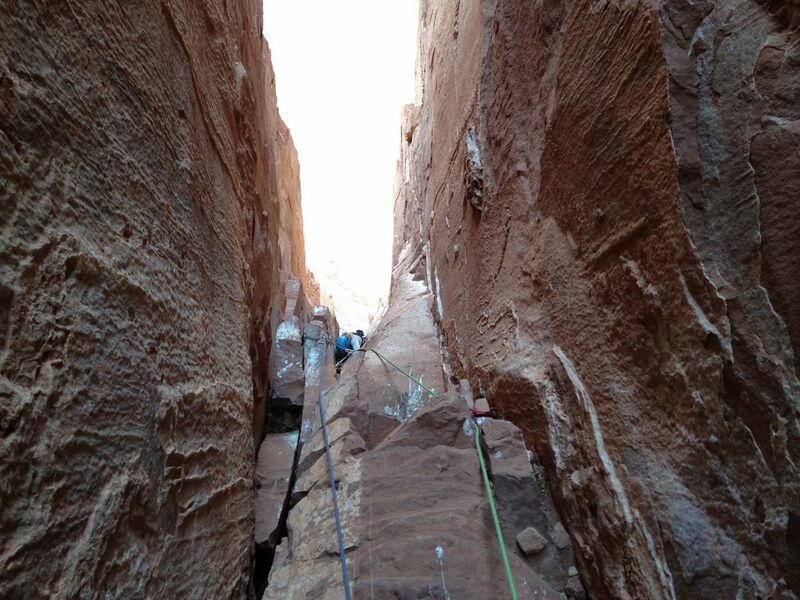 If I thought the first pitch was hard, it made this offwidth section seem like a walk in the park. I did EVERYTHING to get out of this offwidth, including pulling on gear, groping every inch and crevice of the rock and, of course, grunting and yelling. Eventually with some encouragement from the party below and from Bran at the top, I managed to find myself out of the crux section. I was gassed. I ended up a couple of times pulling on some fixed gear along the way left by years of parties struggling their way up this climb but, miraculously, again I found myself side by side with Bran at the second set of anchors. We only had two more pitches to the top! Once again exhaustion was not going to be the reason of defeat so off Bran went for the third pitch. He flew up the third pitch in no time and I was off climbing once again. 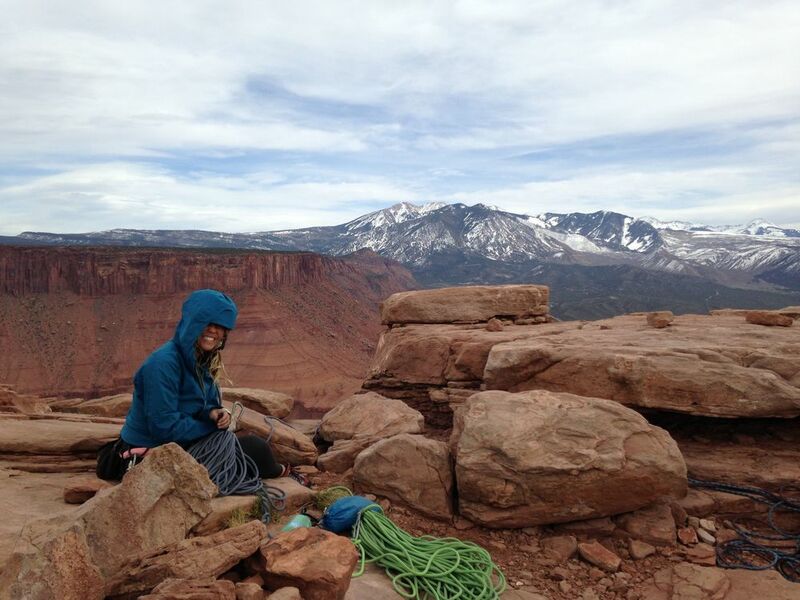 Luckily this pitch seemed to be easier with blockier terrain and some great hand jams along the way. However as I got closer and closer to the third anchor a large, giant boulder was marked with a white x (this indicates other climbers thought this loose rock is going to fall and do not pull on it) Once again, the tower demands the utmost concentration and control. I had to reassure myself over and over again to keep going, cautiously. "DON'T TOUCH THE ROCK WITH THE WHITE X!" shouts Bran. "Gee THANKS!" I thought sarcastically as if that advice is going to help me get around the GIANT boulder teetering on the edge of definitely falling on my head. But, once again, somehow I was at the third anchor. There was only one small pitch left to go to the summit. Bran completed the fourth pitch quickly and I followed - there were no large cracks, offwidths or loose boulders but simply smooth, fun, climbing. So there we were. On top. Wind. Sand. More wind. Some people. All of us just sitting on the top of this tower, mostly in silence. It was truly magical. It seemed like people should not be up here, but there we were. On top. Wind. Sand. More wind. Some people. All of us. Bran and I sat for a minute or two with smiles on our faces, ropes tangled in our hands and adrenaline running through our veins. We did it. We climbed the tower. As we stood at the top soaking in the feelings of accomplishment we were also getting blown over by the wind. A storm was rolling in and we had to get off. We made three rappels down the route and at the bottom collected our packs to begin to head down.